Today was our egg dying day. I have each child bring 2 hard boiled eggs to school for this day. 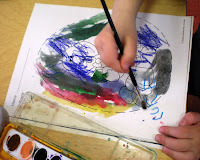 I, being on top of everything, send a reminder note home with the children on Tuesday; Please send 2 hard boiled eggs to school with your child on Thursday, April 7. Did you catch that? Yes, wrong day number. I threw everyone into a tailspin. So I had spent a half hour on the phone last night correcting my mistake. Sometimes I wonder why I even try. Well, everyone got their eggs to school, not without incident of course. The twins had their eggs "in one basket" which got dropped and they smashed. 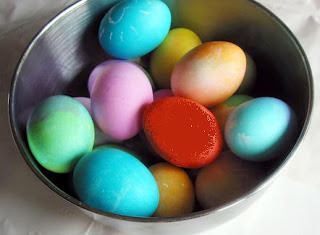 I had hard boiled four extra eggs the night before--know where they were? Yes, at home in my refrigerator. Just can't catch a break. Mom was nice enough to run home, hard boil four more eggs and bring them back for egg dying time. Thanks MOM! Now that everything has gone awry, one would be thinking this doesn't look good. Well, luckily our day improved tremendously. We started off with some laugh therapy that I talked about in my Gift of Joy post. The kids so enjoyed it, we laughed all through the day--great fun! We made our dye together and stunk up the room, then they all dyed their eggs --I forgot to take pictures. The eggs stay in the refrigerator until Tuesday when we hope the Easter Bunny comes and hides our eggs and fills our baskets--just can't wait. Our little guy had another great day today too, maybe he turned a corner. 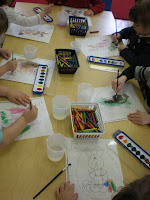 We didn't get to go outside today because of yesterday's rain so we had a skill time. For skill today I had an Easter Egg that I ran off on construction paper. There was a picture of a bunny holding eggs inside the big egg. 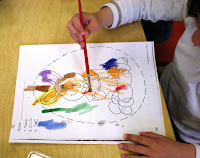 I had the children color the bunny and the eggs then we watercolored the big Easter egg. Always fun to "paint." 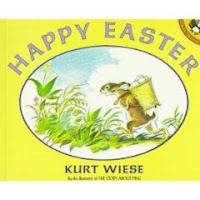 We finished up the day reading the book "Happy Easter," by Kurt Wiese. 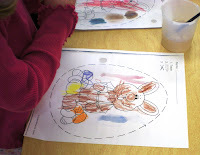 This is a cute story of some bunnies coloring eggs given to them by the hen at the farm. The hen didn't want to give them the eggs at first, but they just weren't hatching so she let the bunnies have them. Boy, do the bunnies get a surprise! My girls love to watercolor paint. Cute picture for them to paint. Sunshine actually had a great lesson from her cyber-art teacher on watercolors and I learned a lot, too.